The decision on whether MPs approve or reject any Brexit deal must be "unequivocal", ministers have said. Brexit Secretary Dominic Raab said the outcome of the "meaningful vote" due to take place in Parliament must be "clear to the British public". In a letter to MPs, he suggests they will have to choose between whatever deal is on the table and no deal - and no other options will be offered. Shadow chancellor John McDonnell said it was an attempt to "fix the vote". 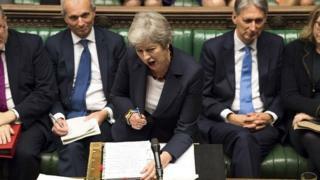 And pro-European Conservative MPs also reacted with dismay, former education secretary Nicky Morgan saying it "appears to be an attempt by the executive to frustrate our sovereign Parliament" while Anna Soubry urged MPs "to stand up to this outrage". The former chancellor Kenneth Clarke told the BBC's Newsnight it was a "silly tactic" and Parliament would "insist on using its proper authority" to keep a variety of options open. The BBC's political editor Laura Kuenssberg said this was a "big fat row waiting to happen". No 10 sources, she said, were insisting the Commons motion on any final Brexit deal would be amendable but "what is not clear is whether amendments will be voted on before after the vote on the deal". Opponents of Brexit have long warned of a "take it or leave it" situation, in which they have to either accept the deal on the table or risk the UK leaving without an agreement. They say MPs should have alternative options if they think the deal is inadequate, such as sending ministers back to the negotiating table or giving the public the final say in another referendum. Parliament has been promised a vote on the outcome of the current Brexit negotiations ahead of the UK's scheduled departure on 29 March 2019. It is increasingly unclear when the vote will be, amid signs that, due to the current deadlock over Northern Ireland, any agreement might not be reached until the middle of December. EU leaders are currently meeting in Brussels to gauge progress. In response to a letter from Tory MP Charles Walker, who chairs the Commons Procedure Committee, Mr Raab indicated the vote should be a simple Yes-or-No verdict on whatever deal was brought back by Theresa May. "Once the deal is presented to Parliament, the procedure through which it is voted upon must allow for an unequivocal decision and one which is clear to the British public," he wrote. "Anything other than a straightforward approval of the deal will bring with it huge uncertainty for business, consumers and citizens." Mr Walker had asked for clarification on what would happen if any resolution was passed by MPs with different amendments attached. Shadow Brexit Secretary Keir Starmer said MPs must be able to scrutinise and, where appropriate, change the text of any vote presented to Parliament. "That is not a meaningful vote. Ministers cannot silence Parliament." The government has said any agreement reached with the EU on the terms of the UK's withdrawal will have to be enshrined in new legislation. Sky News reported on Wednesday that the traditional Commons recess in February could be cancelled to allow MPs to sit longer and ensure the legislation is passed before Brexit day.